Happy New Year to all our Friends and Members! 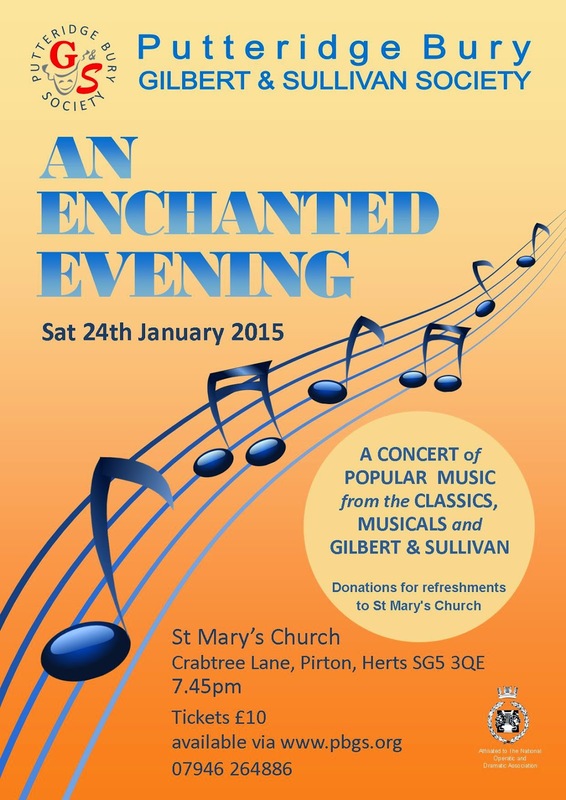 We are kicking off 2015 with a musical treat – there are only 4 weeks to go to our January 24th Concert, An Enchanted Evening at St Mary's Church, Pirton. It’s now time to book to make sure of your tickets. Just click on the BUY TICKETS button wherever you see it on our website to be taken straight to the PBGS Box Office. You can also still ring our 07946 264886 number. 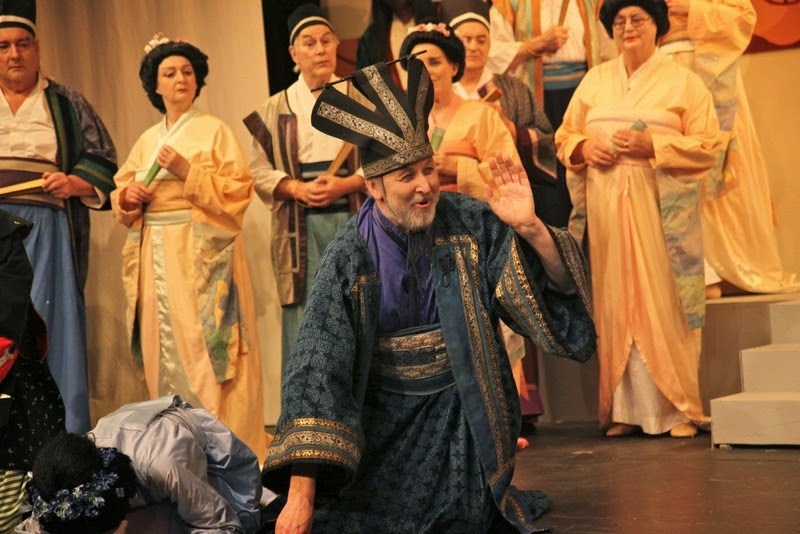 In April we revisited one of our most favourite G&S places, the town of Titipu, in a sparkling production of The Mikado from Director Alison Gibbs and Musical Director Sue Trost. The audience queued at the door to get in and we could tell by the laughter that they loved every minute. In October we ventured Into the Woods clutching our Sondheim scores, following the pathway through the thickets forged by our trusty guides, Director Richard Syms and Musical Director Margaret Johnson, and managed to emerge triumphantly out of them again. Like the characters we felt we’d lived the fairy tale journey! Along the way we elected two Presidents to keep us in order, Anne and Tony Critchley, saw David Crew awarded 'Best Male Performance in a Musical' in the 2014 Noda East District 3 Awards for his wonderful performance as Pooh Bah, and won runner up for 'Most Colourful and Suitable Costumes' for The Mikado. Brian Miles stepped up and took on the mantle of Chairman at our November AGM, and with some techy help from Vice Chairman, Barny Shergold, we developed a new online booking system so you can now order and pay for your tickets directly through our website. We also said a sad goodbye to June Game, a friend and accompanist for PBGS since the first show in 1972. 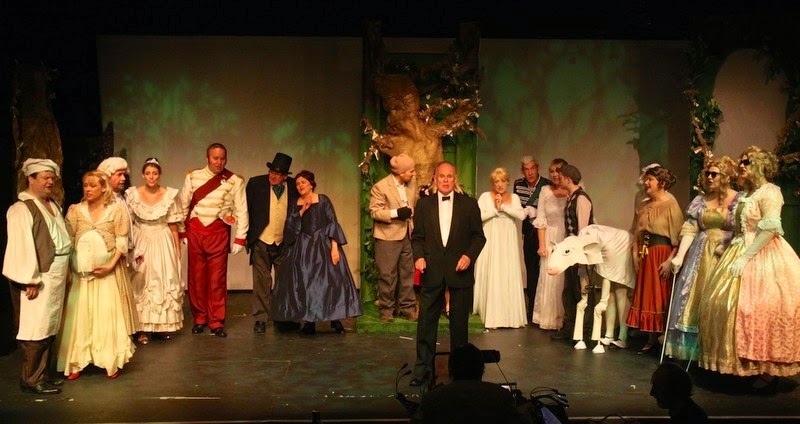 Throughout over 40 years with the society, June was a continual support at rehearsals, using her talents to support the company in all the Gilbert & Sullivan operettas and watching performances as an avid fan. This is a good time to say thanks to all the people behind the scenes and on stage who work so hard to make our Shows successful and also to say thanks to all our Friends and Audiences who support us through the year. We wish you all a very Happy and Musical New Year!